A relatively unknown fairytale that I suspect J.K Rowling pinched some ideas from. The story is about Michael Shoemaker, poor but talented cobbler. His life is hell as he lives with a nagging wife, two teenage children who think money grows on trees plus his mother poor chap! But kindly Elves called Flip and Flop help him in an unexpected way. 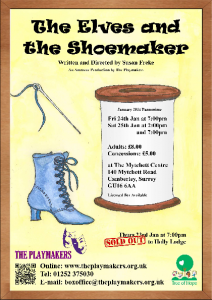 We have a strong ‘shoe’ theme throughout and expect our audience to don their best pair of shoes for inspection. It has the full pantomime swing! The panto gags! The song-and-dance routines! The goodies, the baddies and the ahhhhhh’s. But, best of all it’s nice and short and you will be back for more! £5 per Concession (Under 16 or over 65).